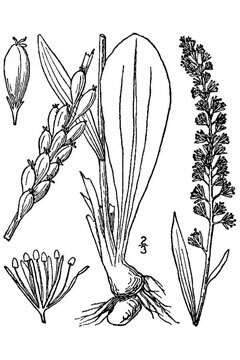 One of the most popular fertility herbs we are asked about is False Unicorn Root (Chamaelirium luteum). I think it is now time to highlight False Unicorn Rt.’s healing powers, but shed light on why we do not promote use of this herb. Both Native Americans and skilled midwives have used this herb for hundreds of years. It is native to North America, but grows best in eastern Canada and the United States. Because of its popularity and the human desire to profit, this herb is now threatened. In fact, wild harvesting of this herb is pushing it ever closer to the endangered list. This herb goes by many names; Helonias (more popular in Europe), blazing-star, devil’s bit and sometimes fairy wand. Out of all of the North American territory where False Unicorn Rt. grows, the southern area from Florida to Mississippi has the greatest potential for cultivation of this herb. As this herb became marketed and sold in greater quantities, it began to rapidly decline. This plant is prized for the rhizome (root), that once harvested does not grow back. Cultivated False Unicorn beds across the U.S. have shown little to no results in regrowth of the rhizome which, despite great effort, is a little discouraging for potential marketing. One farm that has had some good results in cultivating this plant is Horizon Herbs in southern Oregon. In 2001 alone, wildcrafted (harvested from the wild) False Unicorn Rt. sold for $35-$50 a pound, with annual sales of $700,000.00. That was 13,500 pounds of the rhizome wild crafted in one year. In 2003, this herb was selling for up to $65 a pound. As demand grows, so does the price. The continued decline of this herb drives the price up as well, making the herb more and more difficult to find. Today, most medicinal botanical companies have stopped purchasing this herb for their products. USDA-NRCS PLANTS Database / Britton, N.L., and A. Brown. 1913. An illustrated flora of the northern United States, Canada and the British Possessions. Vol. 1: 489. False Unicorn Rt. has been touted as the perfect herb for helping to regulate menstruation as well as prevent miscarriage; this may have been what has contributed to its decline. This herb is mentioned regularly across many forums for women’s fertility health. It is an herb frequently asked about in online communities which makes me wonder where women are even hearing about it. I am part of many forums on women’s fertility and, in spite of this plant’s fate, I still see women not only asking about it, but recommending it, or suggesting that other women learn about it. We need to be clear up front that while this herb may have beneficial healing properties for fertility issues, it is a plant that is struggling. For hundreds of years, this herb has been used for women with recurrent miscarriages related to uterine and cervical weakness. It has also been used to heal women with uterine prolapse (where the uterus comes through the cervix into the vaginal opening). There was a case report that showed that when given a tincture of False Unicorn Rt. every hour during threatened miscarriage, bleeding and cramping were stopped, while human chorionic gonadotropin (HCG) levels rose. False Unicorn may also be valuable in aiding women with low to no cervical mucus, as well as women with amenorrhea (absent menstruation). It is very helpful when there is stagnation of the uterus or ovaries present; some signs of this can be dark, sluggish, clotty menstrual blood. This root has been shown to work in the body by interacting with estrogen receptor sites of the hypothalamus. It is said to increase estrogen, aiding the ovaries in releasing a mature egg at ovulation. False Unicorn Rt. overall has not been studied that much. It may seem that this herb sounds perfect for you but, in reality, there are a variety of other wonderful herbs with similar actions that may be just as effective. Tribulus (Tribulus terrestris), Vitex or Chastetree berry (Vitex agnus-castus), and Dong Quai (Angelica sinensis) are some examples of fertility herbs with similar actions. As for aiding in prevention of recurrent miscarriage, Partridge berry (Mitchella repens) is a great alternative. False Unicorn Rt. should only be used under the supervision of a skilled herbalist, naturopathic physician or midwife. It also should only be chosen when all other herbs have failed to produce desired results and has been prescribed by a qualified herbalist, ND or midwife. If one of these practitioners suggests you use this herb or a formula containing this herb, be sure to ask them where this herb was sourced, meaning where did it come from? If they say it was wildcrafted, ask if there is another herb that could be use in place of this plant. I am proud to say that Vitanica, makers of Pregnancy Prep and Fem Rebalance, which is formulated by Dr. Tori Hudson, ND, has modified those formulas that once contained False Unicorn Rt. They now contain Maca. In addition, Women’s Best Friend, a popular herbal formula in our Fertility Cleanse Kit and sold individually in our shop now contains cultivated False Unicorn Rt. Our world is always changing. Modernized societies are taught to consume and consume all resources available, without much understanding about balance and sustainability. Because of over-harvesting of False Unicorn Rt. and many other popular medicinal herbs, the threatened plant species list is growing. Before choosing any medicinal herb or herbal blend, first research about each individual herb. Be sure that the plants were ethically wildcrafted or grown organically. As I said before, if an herb that you use often or are interested in is on the threatened, at-risk, or to-watch list, ask an herbalist or ND in your area for good alternatives. Chevallier, A. (1996). Encyclopedia Of Medicinal Plants (First Edition ed.). DK Press. Romm, A. (2010). Botanical medicine for women’s health. St. Louis, , MO: Churchill Livingstone/Elsevier. I am confused. There is false unicorn in the “Women’s Best Friend” capsules that is sold on this website. I was going to buy some, but I guess I shouldn’t?? The False Unicorn Rt. in the Women’s Best Friend is cultivated to help protect this endangered plant species from going extinct. It is fine to consume in this formula. I used this herb when ttc and it worked. We are now ttc again and I can’t find it on my store shelves anymore so I’m having to look online but I don’t know what to purchase. It’s hard finding good info. I’m looking for a tincture that is made by a reputable company. Can you give any recommendations on where to purchase from? False Unicorn is an endangered species so it is best seek cultivated false unicorn root. Two reputable sources for herbs and herbal remedies, although we are not affiliated, are Mountain Rose Herbs and Elk Mountain Herbs. Thank you for a great artical. I have had three miscarriages and feritlity issues but I wouldn’t use False Unicorn, when there are other alternatives. We have to think about the impact on the environment. It’s like the insatiable appetite for tiger bones, rhino horn, manta ray gills are all driving these amazing animals towards extinction all in the name of medicine. It’s a very sad state of affair when there are perfectly good alternatives. Thanks, I am glad you liked this article!